Thanks so much for all your kind comments yesterday! I swear, my online friends are the best. DH just doesn't get it like you guys do, lol! Today I am showing you a sneak peek from the new set called Blessings. It is beautiful! There are two separate challenges at the end of this post, so check them out! 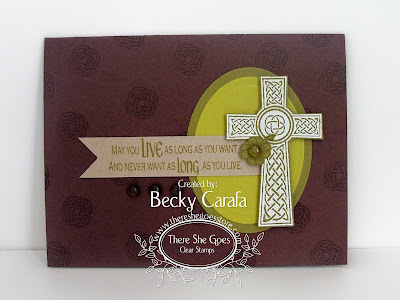 I stamped the background with the Celtic knot, embossed the cross, and added some dew drops as a finishing touch. I had a horrible time trying to get a decent picture of this, the chocolate cardstock kept looking washed out. This is the best of about 15 attempts in all sorts of settings! Challenge 1 - This month's TSG challenge is to BLING IT OUT! So bring out your rhinestones, glitter, sparkle pens, stickles and everything else that you can use to bling out your card. 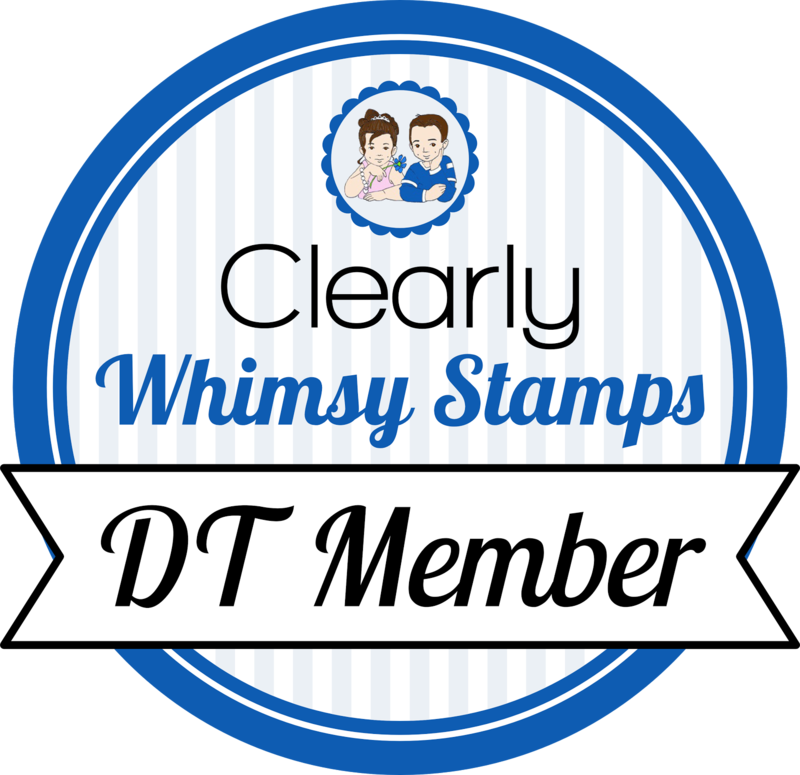 Use TSG stamps and you will be entered to win a free NEW RELEASE stamp set! You have until Saturday 12:00 AM Est. to get those challenge projects in! Please use the keyword TSG04 and enter your name and link to your card using Mr. Linky on this post on Jessica's blog. Challenge 2 - Blog Hop Challenge- Want to win your own "Blessings" set? Just leave a comment on EACH of the Trendsetters blogs. When you are finished, go back to Jessica's blog and enter your name in the appropriate Mister Linky box. You have until 12:00 AM Saturday to get the Blog Hop Challenge comments in as well as the TSG challenge. Good luck! Becky, this card is gorgeous! I LOVE LOVE LOVE the colors....Beautiful set!!! Becky - this is gorgeously designed!!! I love it!!! You did a beautiful job Becky, love it! This is gorgeous Becky!! Love it!! Your card with this set is BEAUTIFUL! luv the colors! Love your pop of color. The greens are fabulous! Gorgeous - love the cross and that sentiment! Verrrryyy nice, Becky! The colors are so rich and I love how you did that little banner sentiment tag! Love the colors... nice job! It really stands out. I might have to CASE this layout and colos it's very different from what I have been seeing lately! Wonderful! Congrats on the new DT! This is a great card! I can't wait to buy this set!! Wow! Your cross really stands out! Beautiful work, Becky!! Love your card, Becky! Fabulous LO and the colors are great. Wow, this is gorgeous! Very CAS but striking- so striking! Awesome! I LOVE this!! Just beautiful!! Love the card ...and the color combo. What a beautiful card. The picture makes your background cs look almost velvet. Which wouldn't that be pretty??? Thanks for sharing your creation. So pretty! Love the White Embossed Cross and the way you did the sentiment. Great Card, SO glad this set is the first peek! Not a color combo that I would have thought of - but looks great with this set. tfs. I love the cross and Celtic knot. Great card! Wow, beautiful card! I love the layout and the fabulous colors. It has such a beautiful elegant look to it!! Beautiful job... the colors are terrific. Such inspiration! the celtic cross and Irish saying. WOWSA! !This is BEYOND GORGEOUS!!! Stunning design and layout!! LOVE this Becky! Right on, Becky! This is gorgemous!! Wow Becky, this is just gorgeous! Love love LOVE this!! Becky this is absolutely stunning!!! I adore the layout and the simple elegance of the card! The stamp is amazing and I love the treatment you did with the sentiment! Wow, what a gorgeous card!!!! Great design very pretty. Love the colors. What a lovely card. I love the color combo you used. TFS! see, now we know why she chose you to join the DT. this is simple and gorgeous! Beautiful card. I love the color combo that you picked. Simple clean and georgous, love it! Beautiful work! And I love the sentiment! Pretty card.. keep up the great work! Two great cards! Very nice. This card is just stunning! I love it, great job with the peak! I love your card and the colors you chose for it!! Very pretty! This is a great card as well. Love the banner sentiment and the colors you used blend well together. Simple yet elegant! Great card layout, love this sentiment! Nice layout and the cross looks great embossed.